San Francisco, California; July 13, 2006; FerryMusic, one of San Francisco’s newest and most promising nonprofit performing arts presenters, may be sailing away after it presents its last two jazz and classical concerts on Saturdays July 22 and 29. The concept of FerryMusic – a floating concert series presented on a boat set against the backdrop of the breathtaking San Francisco Bay – has been the sparkling vision of the organization’s Founder and President, Jane MacLean, for the past two years. The idea was originally based on Bargemusic, a successful venture launched in New York by classical arts maven Olga Bloom, a friend of MacLean’s. 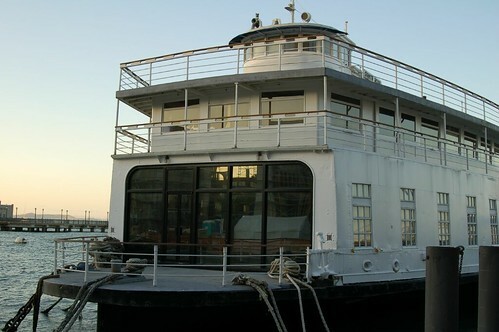 MacLean fell in love with an under-utilized space onboard the historic 1927 ferryboat “Santa Rosa,” which has been owned and operated by Hornblower Yachts as its corporate offices. After favorable meetings with Hornblower, MacLean incorporated her new business as a 501c3 nonprofit organization to include concert presentation and educational programming activities, and quickly enticed many of San Francisco’s art patrons to participate on its Advisory Board and Board of Directors. FerryMusic presented a phenomenally successful classical and jazz trial concert in October 2005 and scheduled concerts April through October 2006. But while FerryMusic has remained a good idea, FerryMusic’s use of the Santa Rosa has remained questionable. Hornblower enjoyed earnings from food and beverage service during FerryMusic’s first concerts in lieu of rental compensation. However, after a year since MacLean initiated negotiations and received consistently encouraging promises, Hornblower executives observed the packed houses for FerryMusic’s concerts and requested a rental agreement, in addition to food and beverage services, that the start-up nonprofit could not meet. MacLean now plans to conclude FerryMusic’s concert series on the Santa Rosa with two concerts planned for late July. World-renowned pianist Denny Zeitlin will present “Solo Voyage,” an evening of solo jazz piano with standards and original music, on Saturday, July 22. The following weekend on Saturday, July 29, FerryMusic will feature Eric Zivian performing selections from Debussy’s Preludes and Ravel’s Piano Trio in A Minor with Melissa Kleinbart, Principal Violinist for the San Francisco Symphony, and Tanya Tomkins, Co-Principal Cellist for the Philharmonia Baroque Orchestra. Those involved with FerryMusic hope that enough music patrons in San Francisco will attend the two July concerts to recoup their expenses and break even. Future concerts scheduled with such artists as Jamie Davis, Natasha Miller, and The Tilden Trio have been postponed until further notice. Whether the organization fades away, occupies another space, or receives funding to return to the Santa Rosa, one thing is certain: the concerts on July 22 and 29 will be two extraordinary events that won’t be soon forgotten by Jane MacLean or any of FerryMusic’s supporters. This entry was posted on Monday, July 17th, 2006 at 1:43 pm. It is filed under Music News/Info. You can follow any responses to this entry through the RSS 2.0 feed.